This entry was posted in Family, Kids, Personal Growth and tagged Creativity, Education, Goals, Homeschool, Humor, Kids, Life, Mother, Parenting, People, Success, Women. Bookmark the permalink. Absolutely wonderful and worthy of hanging on the fridge! HA. I’m glad the tired, crazy woman achieved sOmething worthwhile lol. Thanks for the faithful read, AnnMarie. The second part(Teacher) could be expanded to many a sub categories too, right? I think it deserves a place of promise on the fridge also. Way it go especially Dr Mom and homeschooler hard subjects to pass but you did with flying colors…Good JOB!!!!!! You deserve to brag a little MOM you did good. Actually, I gave myself A- in those subjects because I can always do better. You’d be amazed at what some homeschoolers do. The work is endless. You have to cry, “ENough!” at some point. “He’ll be all right!” Thanks for staying with me. Total average=A. Way to go, Teach! LOL I think you mean that’s what HIS average comes to. I’m not keen on those Bs. Gotta get ’em up. Thanks. You guys are funny. To me, this is nothing to brag about – his or my results. I prefer the grading system of Pass, Fail or Needs Improvement! 🙂 You are far more honest with yourself than I am! My hands would clam up, my heart pound away, as I stood behind my desk at the end of the big day waiting to receive my envelope with the report card in it. I had to get all Es. Now, bleh..I’ll be happy to get WIFE up to a C+. I excel at tired, crazy woman too. Sisters! Well D, you’re gonna have to do better in Wife. Although, a C ain’t bad. But I’m excited to see what kind of wonderful person your son turns out to be!!!!!??? *Hang head* Yes, I’ll have to pull up that C. And whaddaya mean a C ain’t bad? It’s terrible. Might as well be an F to a Korean. Ha ha ha yeah, I hope I don’t screw up the little man too much. And he declared last wk that he decided he’ll be an author one day like CS Lewis. He then got cracking on his next book, this one on Star Wars. I was tempted to give him an A- in the writing. And you are right a C, doesn’t translate well in Asian culture lol. He said I get an A as Wife for the month!!!! Update 5 min later: Never mind. He said it’s more like A- or B+, he was being generous. LOL, that’s too funny well, in college, an English teacher gave a whole lecture on why a C, isn’t a bad grade. It was a night course and most everyone in the class worked full time. So that could be why she said that. I really liked that teacher because at the end of the semester I got a B, because I felt motivated to try a little harder because of the C lecture. Which was probably the point of the lecture. What in the world….? She shoulda been busy teAChing in the time she was justifying some poor grade. In grad school, I wanted the instructor to get to the point. I was there after a full day’s work, having gotten up with the sun, and was paying for my Master’s out of pocket. I didn’t have time for dilly dallying. Yeah I see your point. But it worked for me somewhat. You’re a tough cookie I get the feeling you would make me tired if we were running buddies, SHEESH!!!! Thanks. 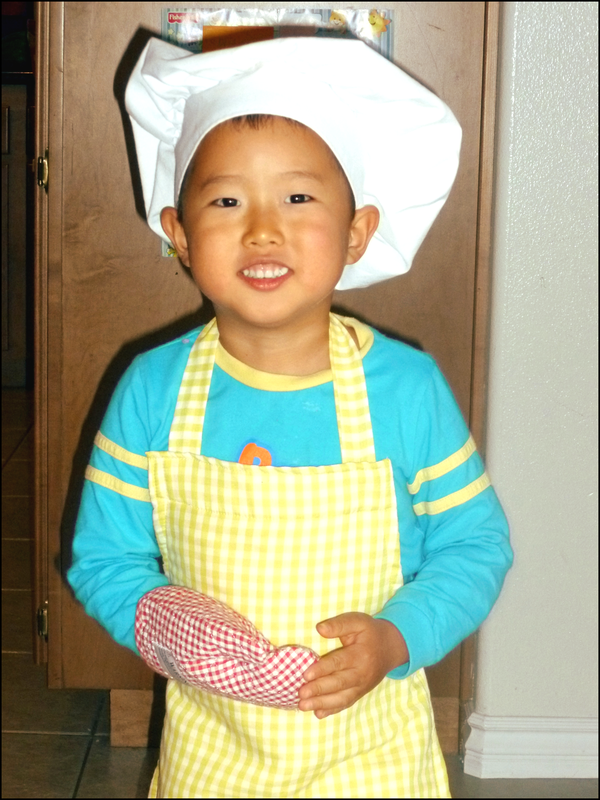 He picked out the gingham pattern himself and went bazooka when we picked it up as his own apron from the streamstress’. Funny, it’s the hat that makes the pic for me, oh wow you had the apron made??? Impressive!!! Laughing at Brad who refuses to keep jabbing and just wants PEACE. Great going here. You’re four woman rolled into one. Not sure how you keep on roiling. By sheer grit is how I visualize what you accomplish. Actually, you hit bulls-eye, Yvonne. Grit. And grace, always heaven’s grace. Nah. I told someone here I don’t consider his grades this term something to be that proud of. =) Remember, I’m Korean. =) You mean you have start with the right choices at the market? Haha, I liked the Teacher section! You have a very smart boy there. HA. Called it as I saw it. I wouldn’t ask you guys to ‘fess up without coming clean myself. LOL Again, I disagree, as it wasn’t a matter of cleverness. Was simply honesty. Although Husband did report I earned at least a B+ as Wife this month woo hoo! Mom needs work, well the wife, at least. Ha ha ha. Boy’s coming along. A great report card! Congrats! *Shaking head* I told some of you here that apart from the Wife’s report that I know is not good, I didn’t put this up thinking the BOY’s was so great. I just put it up being real. We’ve gotta pull his reading and writing up. Teacher’s fault. Means I’ve let the other subjects eclipse those. In my career as a teacher I’ve come to understand that no one is perfect; neither student nor teacher. Yet, I agree with you that one should strive to be so. I was talking about you, Diana. I’m pretty sure I’m right about that one. I love your report card for yourself. It’s a good idea to take inventory every once in a while to see how you’re doing. Great blog.